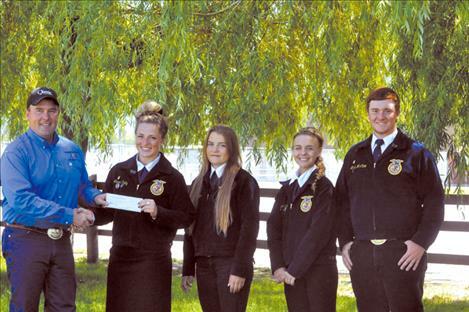 RONAN — The Western Montana Stockman’s Association donated $1,000 of the estimated $10,000 cost of attending the FFA National Conference to the Mission Valley FFA team. The Livestock Judging team will be the first from Mission Valley to compete at the national level. Competition will be held this September in Louisville, Kentucky. “They are an exceptional team and we are proud of them and want to support them,” Association Representative Scott Buxbaum said. Buxbaum presented the check to Laurel Rigby, Courtnee Clairmont, Josey Motichka and Micah McClure.